Property 3: UNOBSTRUCTED OCEAN VIEW! Best Oceanfront Deal on Maui! Property 5: Any Closer Oceanfront on Sugar Beach & You Would Be Swimming! Property 9: Steps away from sand, sea & surf! Property 10: Ocean view suite with shared pool, hot tub, tennis moments from beach! Property 13: Kihei Kai Nani ***CLEAN*** New Remodel Deluxe Unit Close to Ocean! Property 15: Enjoy a Fabulous Maui Vacation! Property 16: Beautiful Napili Shores Condo! ~ Inquire About 2019 Specials! Property 17: Fully Remodel - You won't find a better unit! Property 19: Kihei Bay Surf #253 Studio Sleeps 2, Kitchen, Wifi, Near Beach, Great Rates! Property 20: Popular Condo. Reserve now for Summer 2019! Property 27: Location, Location, Location! Book now to reserve your holiday in Maui! Property 28: Vacation in Paradise! 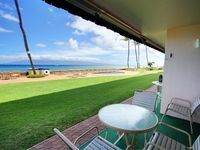 Groundfloor, Ocean Views, central to everything in Maui! High End Remodel Ground Floor Ocean View with AC. Property 30: High End Remodel Ground Floor Ocean View with AC. Property 31: Maui Vista #2110 - Amazing new remodel!! LOW RATES! Best location! Property 34: MORE ALOHA FOR YOUR MONEY - OCEAN VIEW !!! Property 35: Kihei Bay Surf #257 Remodeled 2nd Flr Studio, Part. Ocean View, Great Rates! Property 38: Fabulous Beachfront Property - Ground Floor Corner Unit Steps to the Beach! Property 42: Beautiful Air Conditioned 1 bed 1 bath 616 sq ft Condo Steps from a Great Beach! #605 Top Floor Unobstructed Ocean View/Sunsets, 2015 Remodel/ 2016 New A.C.
Property 43: #605 Top Floor Unobstructed Ocean View/Sunsets, 2015 Remodel/ 2016 New A.C. Beautifully Renovated! Ocean View! Ground Level! Building 10! 100yds to Beach! Property 50: Beautifully Renovated! Ocean View! Ground Level! Building 10! 100yds to Beach! Clean, quiet and comfortable with a great location in Kihei. Lovely pool adjacent to this ground floor unit with amazing sunsets and turtles sleeping on the beach. Kay, the owner is very receptive to your needs as well as the managers on site.